Did Wigner's Friend kill Schrödinger's Cat? Most of us have heard of the famous Schrödinger's Cat thought experiment. As it turns out, there's a variant, and it involves an irresponsible friend, a possibly dead cat, and an even weirder configuration of quantum mechanics. 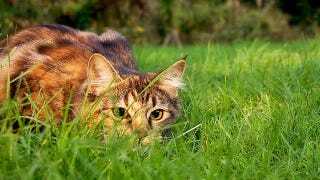 Schrödinger's Cat is possibly the world's most famous animal. It figured prominently in the rather sarcastic thought experiment that Erwin Schrödinger devised in 1935, and has been making headlines and tucked into references ever since. Schrödinger used the cat to explain what was strange, and possibly ridiculous, about quantum mechanics. The experiment is infamous. Lock a cat up in a box with a lump of radioactive material. The radioactive material is of a quantity and kind that, in the next hour, a single atom of it could decay. However, it's equally probably that the atom won't decay. It's a fifty-fifty shot, and that means a lot for the cat, because if the atom decays it will trigger the opening of a vial of poison gas. Different probable quantum states which are unmeasured have to be treated as both existing at the same time. Schrödinger stretched out the quantum state to include the entire system inside the box. So after an hour the atom has both decayed and not, the poison gas has both been released and not, and the cat is both alive and dead. It's only when you open the box that the wave function collapses and the cat lives or dies. Eugene Wigner, a Nobel Prize winner who studied elementary particles and their behavior, laughed in the face of Schrödinger's conservatism. Why, he reasoned, would you apply that reasoning only to the cat? The idea could be stretched further. The entire Schrödinger's cat set-up could be repeated, except Wigner would leave the lab, and put his friend in charge of running the experiment. Wigner knows that his friend will be saddened if the cat dies. He knows his friend will be happy if the cat lives. These are certainties. Therefore, for Wigner, there is an extension of the superposition of states. Until he returns to the lab, one could argue that there is simultaneously a Dead Cat And Sad Friend state and a Live Cat And Happy Friend state. Once he checks on it, one of these possible states becomes reality. But maybe we could go even further. I submit this idea to you. What if that friend was feeling ambivalent about the cat? What if, when he opened the box and saw the cat dead, he could either think, "I really liked that cat," or "It's kind of a relief that I won't have to take care of that stupid cat anymore." Alternately, if he opened the box and saw the living cat he could think, "Yay," or "Damn it." Could these be a superposition of states, and if so, can quantum mechanics determine how you felt about your cat?